Do you believe God will provide a just world? Stop for a moment. Deep in your heart – do you believe God will right the wrongs? Lately the nightly newscasts have been pregnant with stories of tragedy, potentially instilling uncertainty and fear. Will ISIL be defeated? Will the warlords in Eastern Congo put down their machine guns? Can DR-Congo peacefully and democratically elect a new president? 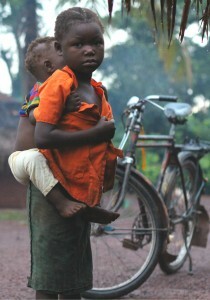 Will God right the poverty, disease, death and corruption that have plagued DR-Congo? In a recent New York Times column, David Brooks characterized today’s age of secularism where “secular people have to fashion their own moral motivation…. in an age of unprecedented mass secularism where millions of people put moral burdens upon themselves. ” Without God, people are alone and must create an inner burden, motivation and energy to impact change. They must solve the world’s injustices under their own steam. I find myself exhausted just reflecting on this. But the Faithful have the power. God is at the center and God is at work. Celebrate this reality! We do not have to create the motivation. We do not have to create the code or work to be the driving force. We can simply lean on the Cross! We believe in a transcendent God who is at work in the world today. We believe. In fact, transformation can take place only if it is centered in the Kingdom. We lean on this transcendent power and clam it in the name of Jesus Christ. Today, let us give thanks for the opportunity to participate in this work. We do not have to create it and yet we can have the joy of joining in with it. So let’s not miss it. Unsure that they could support an entire clinic through the Congo Clinic Initiative, Mission Covenant set a smaller stretch goal. The congregation responded with nearly 4x the goal! Read their story here. When our church decided to give our Christmas Eve offering to the Congo Clinic Initiative, our Missions Committee felt that we should be able to raise $5,000 dollars even though our budgets were tight in 2014. Earlier in the year many of our parishioners faced a long winter with a $6.50 per gallon propane cost for the heating of their homes. Some wanted to aim higher, but we still set our goal at $5,000 since past Christmas Eve Service offerings averaged a little below that. The first week after we started advertising our upcoming offering, our goal was met! We kept receiving gifts and the week after the Christmas Eve offering, we reminded the congregation of the goal and everyone waited to hear how we did. When we shared the total, it caused a collective gasp. $19,947! How did we get involved so deeply? Two of our delegates from last year’s Annual Meeting in Chicago had the opportunity to hear Meritt Sawyer report about the clinics in the Congo. One of the delegates, Dan Diamond, is a former paramedic and the other delegate was my wife Cindy, who is a Registered Physical Therapist. They both came back very excited about trying to promote the need for clinics in the Congo through the Paul Carlson Partnership at our church. The hope was that our church, Mission Covenant would get behind this for our Christmas Eve Offering. When our two delegates came back they also found a kindred spirit in our Church Chair Dr. Joseph Richards who had done a short-term missions trip to the Congo in the 1990’s then enrolled in a Tropical Medicine class, resigned from his medical practice, was commissioned by the Evangelical Covenant in the 1990’s to go as a short-term medical missionary in the Congo. He and his wife sold their home and most of their belongings and were in language school in Belgium studying French when our missionaries were evacuated from the Congo. Dr. Richards, his wife Sally and son Matthew were not able to serve in the Congo as a result. Dr. Richards has been a supporter of the Paul Carlson Partnership so he became very excited for our church to take on the challenge of funding a clinic for the Congo. Together these members have spread their enthusiasm for the Congo Clinic Initiative throughout their church! And now they have the opportunity to continue developing a knowledgeable heart for Congo through CCI.